Note: I started this entry right after our anniversary… I just never got around to finishing it – oops! I was going to back-date it but it seemed like it would get lost then. June 2nd was our one year anniversary – hooray! To celebrate I got to go to the dentists and Eric (having pulled an all nighter to finish a project) slept for most of the day and went to work that evening :) I did get to make us a nice dinner and finally pulled out the nice china that we got for our wedding, but that was about it. That’s just what happens when your anniversary falls on a Monday I guess. We’re planning on doing something together later, it was just too busy at the time to be trying to do anything more than just moving in and keeping our heads above water with work and school. However, it was just a really nice day. It was really cool to remember all the good times we’ve had together. We’re living by Eric’s mom’s philosophy that we celebrate our anniversary every day of our marriage. Which is very true. We’ve done that since we very first started dating. Maybe this is sappy of me to reminisce like this, but every day of our dating we would wish each other a happy however many days we’d been dating… starting from like day 2 :) We’ve remembered every month so far and even though we don’t really do anything too exciting, we enjoy just remembering it. It’s crazy that it’s been a year in two different respects. On one hand, a year seems like a LONG time. I know it’s nothing compared to many people, but we’re not the uber-newlyweds anymore who are still unwrapping gifts (seriously, we’ve even finished our thank you cards!). It’s interesting to look and see the patterns we’ve made, and the experiences we’ve had together already. We’re definitely in a very different place than we were one year ago. When we got married I didn’t have a job and hardly knew what I was going to be doing from that point on. Eric hadn’t yet been accepted into his major and we thought we had three years left of school. A year later we’re down to one more year of school (Eric changed his mind from doing the ISYS Master’s degree in favor of coming back to school some time down the road for an MBA) and both with basically full time jobs. We’ve moved to Orem from Provo and we’re practically old married people now. It seems like this year has held so many changes and has gone by so fast. On the other hand, I can’t believe that we’ve still only been married a year. It’s hard to remember what life was like before being married. Being married just is so natural and wonderful that it seems crazy to think that it was ever any other way. Anyone who says that the best times are when you’re young and single is high. It’s wonderful to be able to come home at the end of the day to someone who you love and loves you back and not have to have all the stress of “oh, does he like me”, “what will he think if I do that”. Dating is so complicated and I’m definitely glad to be out of that scene. So, we now have one wonderful year behind us and many many many wonderful years to come. Happy Anniversary, I love you Eric! Practice the violin on a consistent basis. 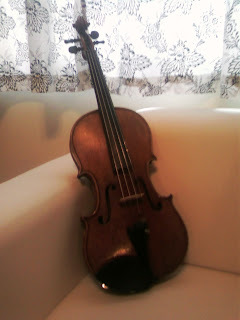 Nothing like I used to, mind you, but when I pulled out my violin last week to review some old music, years of nostalgia rushed over me. I would be happy if I could get to that once a week. Finish my Independent Study course. Yeah, yeah, I guess I’m not really out of school for the summer term, but I don’t think Independent Study courses count. It would also be cool to read some books or get back to work on my own novel, hehe. Surefire way to get out of debt! Brittny and I saw this video on hulu.com, and it is absolutely hilarious because it is absolutely true!